An overview of the evolutions in manufacturing technologies, information technology evolutions in the manufacturing sector and manufacturing trends against the backdrop of IT and OT convergence and changing smart manufacturing processes and priorities for the period 2018-2021. The digital transformation of manufacturing, ongoing convergence of IT and OT and the usage of IoT, in combination with other technologies, are changing the face of the manufacturing technology landscape and the face of manufacturing itself (processes, people, work, business models and so forth). Although manufacturing technology traditionally refers to the various devices, systems and platforms used in manufacturing, we can’t but add a range of IT technologies to it in this ongoing convergence of IT and OT in a world where IP, data analytics and IoT in manufacturing drive the accelerating adoption of more recent technologies such as digital twin technology. In the end, the convergence and hyper-connectedness in manufacturing, with ubiquitous data, turned into actions, is part of the essence of the essence of the broader scope of industrial transformation as we see it in Industry 4.0, Logistics 4.0 and the Industrial Internet. Manufacturing technology and operational technology obviously remain key on many levels and are constantly changing too, albeit with blurring distinctions and with applications that strictly speaking aren’t always just for manufacturing. Think about evolutions in additive manufacturing, nanomanufacturing (and nanotechnology), next gen industrial robotics, evolutions in energy storage systems, next gen tooling equipment, biomanufacturing, cobots or technologies to make, move and handle materials. Operational technology typically plays a role on the level of control, engineering and automation with a focus on, among others, process control and protocols of communication and equipment interfaces in (isolated) areas of automation. This monitoring, steering, instructing and control of physical assets ranges from devices such as control valves, conveyors and pumps to industrial control systems and the control network of a power grid. Control systems range from Programmable Logic Controllers (the control level of manufacturing) and SCADA systems (the production level) to distributed embedded systems. Along with these operational technologies, manufacturing technology traditionally also includes, among others CAD and CAM software, Manufacturing Execution Systems (MESs, the operations level of manufacturing), industrial robots, tooling for drilling, machining and shaping materials and the various additive manufacturing technologies of which 3D Printing is one. Part of the convergence of OT and IT, which traditionally is seen on the level of management and solutions such as ERP (which as you will read is poised to evolve to ‘intelligent ERP’) as you can see in the image above (adapted from our Industry 4.0 overview page), is to connect, integrate, interoperate and reconcile whereby value generation is the goal instead of isolated islands of management and control as is nicely illustrated in the image below from this somewhat older but very relevant blog post on IT and OT convergence from Schneider Electric’s Tim Sowell. Obviously, and as often mentioned the integration of IT and OT isn’t just about technologies, including several layers of manufacturing technology. It is also about culture, people, processes and so forth. Convergence isn’t just happening in IT and OT. Moreover, in more than one sense it’s a simplification. Digital technologies are ubiquitous. IT technologies are used for inventions and applications in scientific areas, the development of new manufacturing gear, new materials, advances in laser process gear, various forms of presses and rapid prototyping, all areas of manufacturing technology, as much as they are used in areas where distinctions blur even more such as next gen industrial robots, cobots and so forth. By way of examples read how ABB Robotics leveraged IoT to transform its industrial robot service model or check out how manufacturing tooling company Sandvik Coromant came with a predictive analytics solution and develops manufacturing tools and machining solutions that help manufacturers build the parts they need whereby machining data is also collected from sensorized cutting tools. Another example: in September 2017 the latter company introduced connectivity capability to its series of Silent Tools tool holders, enabling data from the machining process to be collected and sent to a dashboard, giving the operator a valuable insight into what is happening inside slender tubular components. These are just a few of many examples of evolutions in the industrial technology space, enabled by IT. At the same time, convergence and integrations are also happening in what we traditionally call IT technologies, as well as their applications, even giving birth to and/or driving again new technologies and applications as described in our article on the impact of the convergence of IoT, big data analytics and AI. We previously kicked off a series of digital transformation trends for 2018 and several years beyond by emphasizing the need for and evolutions towards ever more convergence and an increasingly interconnected digital transformation approach, away from the silos of technologies and towards the building of many bridges as needs to occur in any mature digital transformation strategy. The forecasts with regards to IT solutions which are mentioned in our article on key information technology evolutions enabling digital transformation in 2018 and beyond is a clear token of this convergence and increasing hyper-connectedness. In industrial transformation the Industry 4.0 approach, is another clear illustration that shows the blurring of the traditional boundaries in OT, IT and industrial technology. And it’s not just in manufacturing: cross-industry use cases permeate any industry in any technological area. While we’ll keep reporting on manufacturing technology, whether it’s more IT or more OT, it will decreasingly happen. Because that mentioned convergence is happening on all levels and because the hyper-connectedness is slowly happening too. Sure, IT and OT convergence is not a fact yet. Sure, manufacturing technology devices and SCADA systems to get data from PLC controllers, valves or several control systems are not gone. Sure, there is still quite some ‘traditional’, yet changing, manufacturing technology but that doesn’t change the essence. Welcome to your expanded manufacturing technology reality which includes anything IT-related, from cloud computing and edge computing to augmented reality, artificial intelligence and multiple mixes, integrations and cross-fertilizations of these technologies themselves, as well as integrations with what we traditionally understood as manufacturing technology. The technological changes in manufacturing and beyond go hand in hand with important changes in manufacturing as an industry and as a series of operations and processes which take place in a broader ecosystem and changing smart supply chain management reality. It also goes hand in hand with changes on the level of humans and how they work. Keeping in mind convergence, hyper-connectedness and blurring lines between virtually everything in manufacturing, here is a look at some of the main manufacturing technology evolutions and main manufacturing trends and changes ahead as reported by IDC in its “IDC FutureScape: Worldwide Manufacturing 2018 Predictions” webcast on November 8, 2017. IDC forecasts that by 2021, 20 percent of the largest (G2000) manufacturers will depend on a secure backbone of embedded intelligence to automate large-scale processes and speed execution times by up to 25%. This backbone will use IoT, blockchain and cognitive (artificial intelligence and machine learning). We know that with industrial IoT, advanced analytics and AI, intelligence moves to the edge. Not just in the sense of edge computing and IoT but, more importantly, on the level of enabling controls and actuators (along with sensors the field level) to take autonomous decisions. You can compare with what happens in building management as you can read in this interview on building management evolutions and drivers in the age of IP and IoT: based upon contextual parameters, decisions are taken and reported back to the front end. We also know that the combination of IoT and AI is not just a key IoT evolution that will really unleash the power of IoT (in this scope among others for product/asset performance data, maintenance and asset management and so forth), but that will also enable this embedded intelligence which does reminds us of the autonomously deciding cyber-physical systems of Industry 4.0 and Logistics 4.0. The role of AI in the equation is mainly one of advanced analytics adding to existing analytics (focus on patterns), optimizing processes, customer preference identification etc. The addition of blockchain can be seen as a surprise, yet it isn’t. Trust and security in transactions, authenticity and quality of products and more. Do note that there are of course also new systems to integrate it all, so watch the intelligent ERP space. Even without blockchain we think that embedded intelligence is an evolution, albeit in a less end-to-end way. A second prediction for the manufacturing industry overall from IDC is that by 2020, 60 percent of the top (G2000) manufacturers will rely on digital platforms. These digital platforms should by then enhance their investments in ecosystems and experiences and support up to 30 percent of overall revenue. That deserves a bit more explanation, starting with the definition of what such a digital platform is. IDC has been using the term for a few years now, among others forecasting the fast expansion of industry-specific digital platforms since 2015, an evolution which is alive and well today and remains important for the future, also in manufacturing. Essentially a digital platform is the technology platform that enables to transform and offer new services and capabilities, leading to business and innovation platforms which are based upon several technologies. 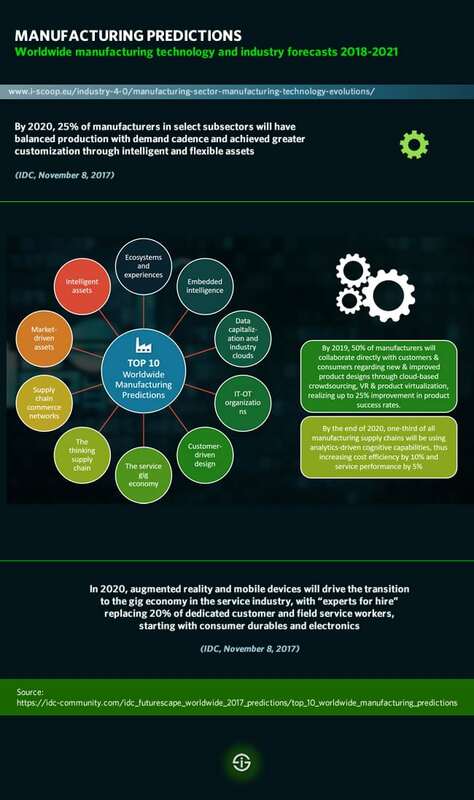 In the “IDC FutureScape: Worldwide manufacturing 2018″ report webcast on November 8, 2017, IDC’s Kim Knickle defined the digital platform or DX platform as the ‘technology architecture that underpins digital transformation initiatives and the technology for the ecosystems’ (customers, workers, suppliers, partners and so forth). The experience part essentially refers to what the stakeholders using them expect from these platforms. Knickle gives a few examples of manufacturing initiatives to leverage such platforms: Skywise, which was launched by Airbus as an open data platform for aviation on June 20, 2017 and Boeing’s cloud based commercial aviation platform, announced in 2016 and aiming to enable airlines to optimize in function of environmental conditions as provided via the analytics. There are others and the types of platforms which are designed leveraging data in industrial markets and manufacturing, from platforms for direct sales to consumers (e.g. fitting in the industrial transformation context of enabling consumers to order tailored products as we see in some sporting goods manufacturing business) to the kind of platforms where we see data ecosystems and initiatives arise to monetize analytics and data, not just directly, but most of all by developing new services and business offerings through industry data collaborations, where among others projects such as Industrial Data Space come in and where blockchain could definitely play a role too. These are the two predictions we elaborated on most and you can listen to the webcast to learn more and the other predictions for manufacturing in a context of, among others, “empowering the material world”. However, let’s also look at the other manufacturing technology and manufacturing predictions which IDC’s Kim Knickle mentions in her Top 10 Worldwide Manufacturing Predictions overview. Some of them are probably better known already or are explained in other articles on our site (and continue to be). By the way, do note that some of the evolutions are coming to manufacturing sooner than others (e.g. IT-OT organizations and intelligent assets come several years before embedded intelligence) and that some have a larger organizational impact than others. According to IDC, the need to integrate IT and OT, as a consequence of the increasing usage and importance of IoT, will result in the fact that by 2019 over 30 percent of all IT and OT technical staff will have direct experience in both areas. Not unimportant of course and, when looking at the time to mainstream axis happening soonest with relatively little organizational impact which is mainly on levels of management (training, ensuring collaboration, hiring, the list goes on). IDC speaks about IT-OT organizations. As mentioned industrial transformation is looking a lot at data capitalization and monetization. The monetization of data is also a key evolution and priority in the IoT industry and data exchanges, as well as mechanisms to organize the leverage of industrial data, are being thoroughly looked at. However, here we are in the usage of industry clouds (with cloud in general of course being a key technological evolution in manufacturing in general) and, although IDC expects that by 2020 a large majority (75 percent) of all manufacturers will participate in industry clouds (which can serve several purposes) only one-third of these manufacturers will monetize their data contributions. While the data capitalization and industry cloud participation are a bit further away from the time to mainstream perspective than IT-OT organizations, intelligent assets are expected to be mainstream sooner. IDC predicts that by 2019, 15 percent of manufacturers who manage data-intensive production and supply chain processes will be leveraging cloud-based execution models with edge analytics for real-time visibility and operational flexibility. With the movement of intelligence to the edge and, on top of edge analytics, the increasing usage of IoT and the need for fast visibility into the overall manufacturing processes in the real-time context of optimization, maintenance, asset performance, the overall supply chain and so forth this is also a clear priority in the scope of Industry 4.0. IDC further has several predictions on the level of the (end) customer and customer-driven design (also think digital twin technology) whereby we see roles for digital economy concepts such as crowdsourcing. Talking about digital economy phenomena the company also predicts the rise of the gig economy in the service industry. Other predictions concern the evolutions in smart supply chain management with supply chain commerce networks and the thinking supply chain in a further future. You can check these forecasts – and others – all out in the mentioned overview and some are explored more in-depth with context in the webcast and of course in the report. Obviously, the evolutions in manufacturing in general are just part of the overall manufacturing and manufacturing technology puzzle. Just as the ERP system is changing towards a more intelligent ERP in the future, the MES (Manufacturing Execution System) is evolving. Moreover, many predictions concern the largest global manufacturers. Last but not least we shouldn’t forget the – less predictable – outcomes of industrial transformation initiatives, priorities, programs and strategies as they are shaped and boosted by industrial organizations, countries and regions across the globe. The circular economy, ecology, regulations on the level of CO2 emissions, the requirements for manufacturers (and others) on levels such as energy management and energy-saving technologies for which de facto some regulations require advanced analytics, the political decisions and so forth all play a role. If the UK government, for instance, agrees with the Made Smarter Review industrial strategy which is published as a recommendation for the fourth industrial revolution industry strategy, we’ll see a prioritization of industrial technologies such as additive manufacturing and virtual and augmented reality in the UK. If the EU’s manufacturing industry gets what it wants there will be quite some focus on that circular economy, cybersecurity and the free flow of non-personal data. Other regions have other agendas but in the end they all overlap and are about far more than industrial technologies alone. While in some countries manufacturers might still be dealing with paper-based processes or leveraging cloud computing and big data and only now starting to put the first steps in IoT, large manufacturers and the more advanced are already fully active in one or more of the mentioned areas. The blurring of industrial technology and convergence of IT and OT with a focus on optimization, flexibility, productivity, making assets and industrial tools smarter, automation and data is what it’s still about for many. Interesting evolutions ahead in manufacturing – and really many stakeholders, factors and decisions that will affect the face of industrial transformation with differences per region, priority, type of manufacturing, company and regulatory frameworks indeed. Top image: Shutterstock – Copyright: SvedOliver – All other images are the property of their respective mentioned owners.